The Project 23700 ship Voyevoda is designed to support rescue operations and transport and supply small search and rescue craft. The ship can carry four boats and two helicopters. The vessel has a displacement of 7,500 tons, a length of 111 meters, a width of 24 meters, a speed of 22 knots and endurance of 5,000 miles. Rosmorrechflot already operates a fleet of rescue and salvage vessels, including some with significant icebreaking capability, but the new vessel is a departure from the more “workboat-like” ships they currently have. 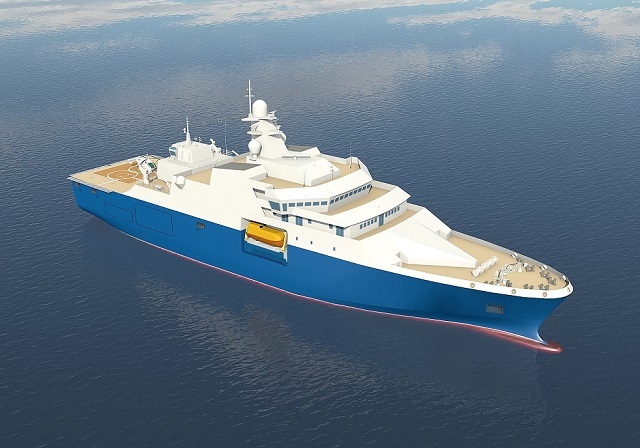 Also, while it’s just a concept rendering, the existing fleet has a bright red hull (and sometimes red superstructure) with the text “RESCUER” painted in white. The color scheme does look more like the Russian CG.